Wenchi is beautiful and we enjoyed it. Our daughter's favorite part of our trip was riding the horse on the mountain. Nurelegn is an excellent guide. Some notes on this particular tour: If you are staying on the east side of Addis, the ride each way is at least 4 hours. Take 2 days and stay the night. You will be driving on a bumpy, bad road right on the edge of a huge cliff for about 20 minutes which was scary. You need to be in quite good shape to do the hike if you are not used to the altitude. TOUR GUIDE RESPONSE: Thank you Very Much Mrs. Oetken. I Had Great time with you and your Familly : I am Glad your Kihana loved the Horse Riding . I Totally Agree with you it is Much Better to spend 2 days with additional activities/sight seen . Your Program didn't allow you to do so. 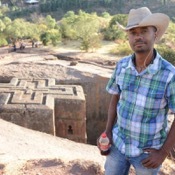 I wish to Meet you and your Family In Ethiopia again. Please Extend My best to all.